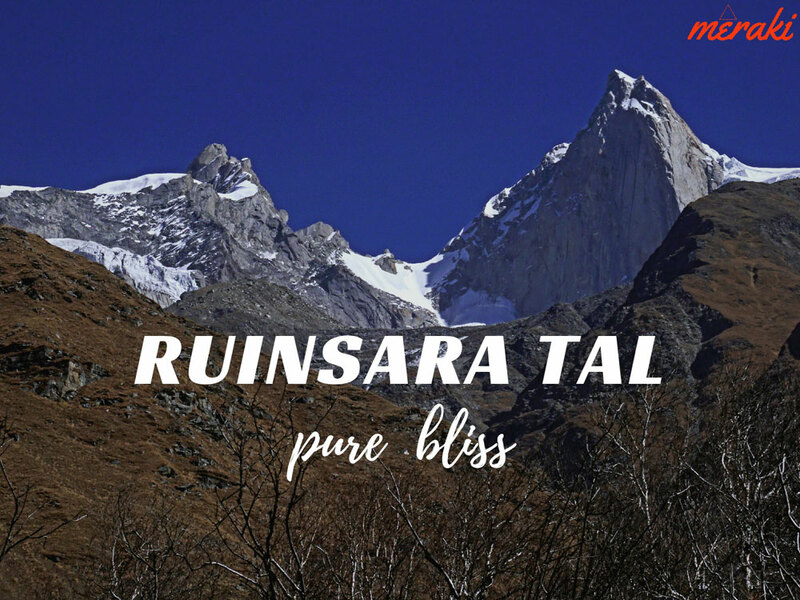 While exploring deep into the venerated valleys of Garhwal, you’ll be left in awe by the ethereal beauty of Ruinsara Tal tucked at 3,500 metres above sea level. This glacial blue lake is adorned on the foot of Kalanag Peak about 14 km away from Osla/Seema. Besieged by the alpine vegetation and rosy red rhododendrons, the Ruinsara Tal is considered to be sacred by the inhabitants of Har-Ki-Doon Valley. The locals residing in this area believe that they are the descendants of Kauravas and have built temples in their honour. Polyandry is practised here and is common in the area. According to the legends, this is the route that the eldest Pandava brother, Yudishtra took while heading to Swargarohini, the way to heaven. 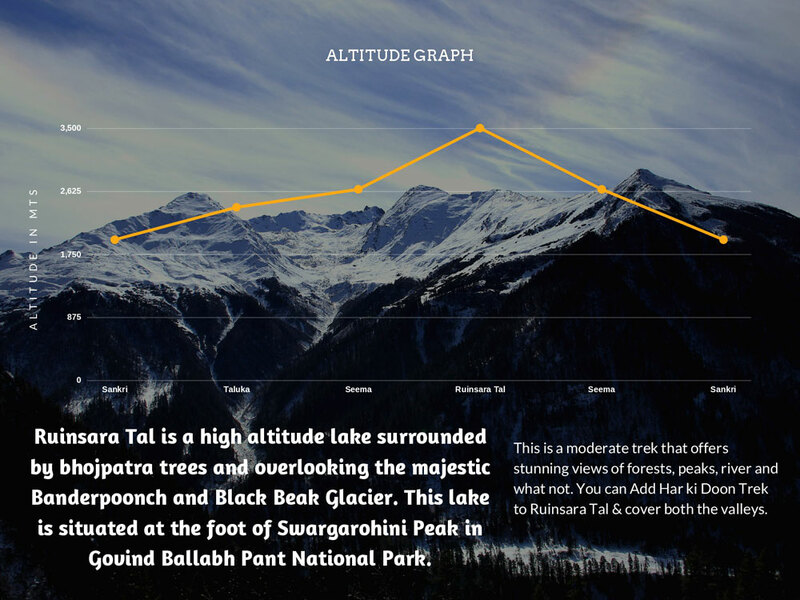 Many trekking enthusiasts flee to Uttarakashi to set their foot on the adrenaline pumping Ruinsara Tal trek which is a nature therapy to many distressed souls. The Ruinsara Tal is a moderate to easy trek that can be completed within 3-4 days. This 55 km trek starts from Taluka village and begins with an easy gradient that continues till you hear the gurgling music of brooks and colossal waterfalls. Walk under the clear blue skies and canopies formed by chestnut, deodar and sycamore trees. 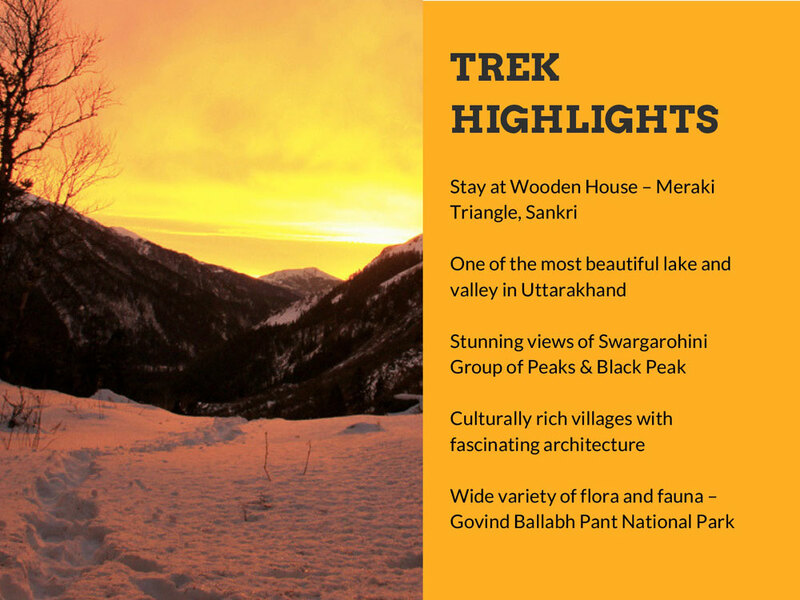 The trek moves largely towards the Supin River Valley, the upper catchment area of Tons river. Maintain your pace and you’ll soon come across the lush green meadows carpeted in the midst of a thicket. Cross a small bridge across the Ruinsara Gad or stream, after which you’ll notice short patches where the path has been disrupted by landslides and heavy downpour. Tackle this stretch with patience as one wrong move can cause broken concussions. A moderate climb will take you along the mountainside and soon you’ll catch a glimpse of a bubbling stream. There is a log bridge to access the river which is at times washed away by the stream. Now take the moderate climb and a few hut-like structures will bring you closer to the ravishing Ruinsara lake nestled at the base of the mountain. Pitch your tents here and gaze into the beauty of this placid lake. On the south-west is Yamuna Kanta, the pass leading to Yamunotri. To the east, you can see the majestic Bandarpunch Peak (6,387 m) and Swargarohini (6,252 m) in the north. The spectacular views of Dhumadhar Kandi (5,873 m) to the east, Kalanag (6,387 m) and White Peak (6,102 m) to the south-west are a sight to savour from here. Ruinsara Tal makes a perfect camping site as it offers a gorgeous panorama of the towering Himalayan peaks and the thick foliage of nature surrounding the area. The wooded haven of Ruinsara is a home to several bird species like the Parakeets, Cuckoos, Owls, Minivets, Bulbuls and Thrushes. You can occasionally spot the Himalayan Monal, Koklass Pheasant, Western Tragopan, Steppe Eagle, Golden Eagle, Bearded Vulture and the Himalayan Snowcock. One can have undiluted views of the majestic Kalanag, Ruinsar range, Bandarpunch and Swargarohini peaks from here. The ideal time to set your foot on the Ruinsara Tal trek is between the months of May-June and September-October. What is Ruinsara Tal Trek famous for? Ruinsara Tal Trek is famous among tourist as High Altitute Lake, Trekking. Ruinsara Tal Trek is popular destination for following activities/ interests - Adventure, Lakes, Trekking. Travelling to Ruinsara Tal Trek in 2019? Contact us for planning your Ruinsara Tal Trek tour with best travel packages of as per your requirements!